With spring pea season only lasting so long, the time is now to get your hands on some freshly plucked ones as they are hitting their peak. 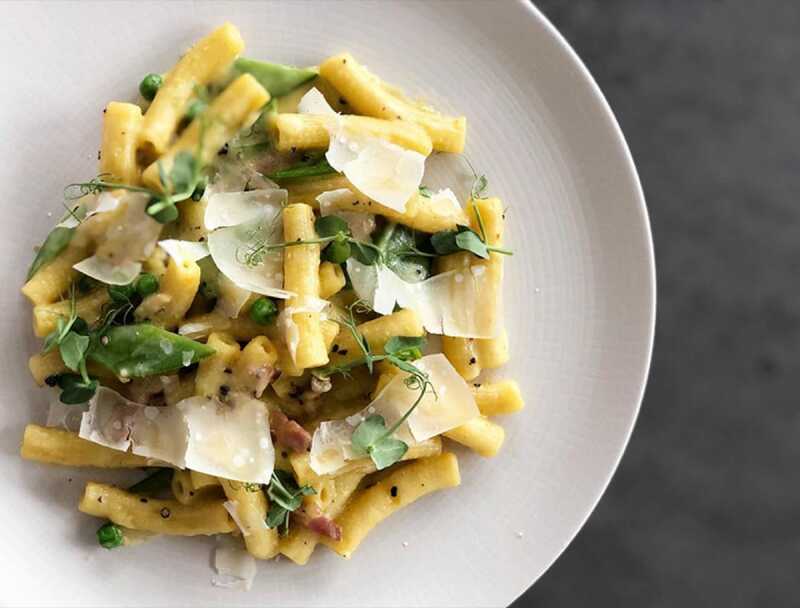 At Daniel Boulud’s refined Mediterranean restaurant near New York City’s famed Lincoln Center, Boulud Sud, executive chef Travis Swikard dishes up egg yolk rigatoni that’s tossed with two types of peas, grated Parmesan, butter and house-cured pancetta. And if you can’t find any at your local farmers’ market, frozen peas will certainly suffice to make this recipe at home. 2. Make the egg yolk rigatoni: In the bowl of a mixer fitted with a dough hook, mix all of the ingredients for 15 minutes. Remove from the bowl and let rest for 10 minutes. Once rested, start extruding by cutting every 2 inches. Place the fresh pasta in an air tight container with enough semolina to avoid sticking. 3. Heat a large pot of salted water to a boil; cook the rigatoni for until al dente, about 5 minutes. Reserve the pasta water. 4. To assemble: Render the pancetta in a hot pan with olive oil; once 90% cooked, add both peas and season with black pepper. Cook for 2 to 3 minutes before adding 2 cups of pasta water from the rigatoni. Toss in the Parmesan and butter. 5. Quickly remove from heat and add the egg yolks. (Add more pasta water if needed.) Garnish with shaved Parmesan and pea tendrils and serve immediately. Image courtesy of Boulud Sud.